Rather than doing a numbers recap of the Seton Hall game, we're going to take an indepth look at the performance of Marquette's top four players during the Big EAST. These Top Four are obviously James, McNeal, Matthews, and Hayward. If you read the Numbers Recaps, a lot of this is what we cover on a game by game basis for individuals. The only new information is Win %, which is a view of whether or not a player is a winning player based on their Offensive and Defensive Ratings. Just like in all win percentages, 0.500 is average, meaning that the Offensive and Defensive Ratings are the same. During Conference play, Marquette as a Team is averaging an Offensive Efficiency of 105.2 and a Defensive Efficiency of 101.5. This is nowhere near as good as our full-season averages on Pomeroy's site, which should be no surprise. The net points for our team is 48 during conference play, which means that for the entire Big East season, we've scored 48 more points (882) than our opponents have scored (834). Our team's Expected Win% is 0.601 based on our offensive and defensive efficiencies. Considering that we're barely above 0.500 in conference now (7-5), this makes sense. Jerel McNeal has the highest usage on the team during conference play. He is consuming almost 20% of all team possessions. However, his ORtg is well below the team average. Even though his DRtg is better than team average, it's not low enough to account for the misfires on offense. High usage + Low ORtg is bad. McNeal, in spite of this, has 3 net points for conference play. However, looking at his Win% 0f 0.250, McNeal has not been a winning player during conference play. He's hurting the team with his low Offensive Rating and high usage. Wesley Matthews is getting it done on the Offensive end. His ORtg has been much higher than team averages during conference play. This gives Wesley 13.8 net points, meaning that he is providing about 30% of our net points. Matthews also has an individual Win % of 0.794, which is better than the team Expected Win%. However, Lazar Hayward has the best Win% of the four at 0.812. His ORtg and DRtg are better than the team averages, and he's chipped in 33.6 net points. Hayward really deserves consideration for most improved in the Big East. He is easily our most valuable statistical contributor. It's going to be fun watching him for the next few years. In summary, the individual contributions reflect that reality for the entire team. After all, the team is 7-5 in conference, so it's to be expected that individual results aren't that great. 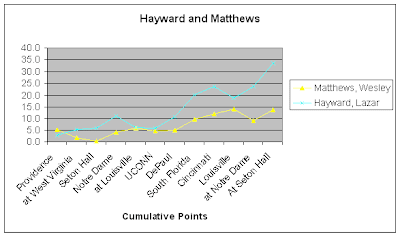 Hayward and Matthews have been the consistent team leaders during conference play. 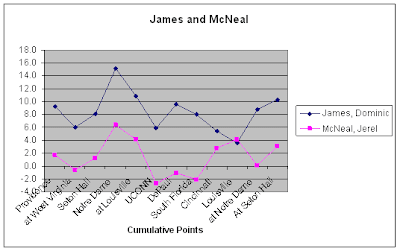 However, James is marginal in his conference contributions, and McNeal is not a winning player! Is there anything in their cumulative point trends that helps provide more insight? Cumulative point graphs show how a player is trending. Upward slopes are trends of consistent positive contributions to games, and downward trends are consistent negative impacts on games. In the cumulative points graph, we can see exactly how valuable Hayward has been. His contribution slope is just steady and upwards. Essentially, his only negative net games were against Louisville and Louisville. Matthews has been steady and on a gradual rise, albiet unspectacular. One can look at the above graph for James with the image of Nutter's first flagrant foul in your mind. This cumulative points graph shows that James has had a downward slope since the first Seton Hall game (minus the ND uptick). Now that Dominic appears to be healthy again, his contributions are on the rise. Before he was injured, James was easily the most valuable statistical contributor on the team. Since James now appears healthy, we can look for his and the team's improvement. McNeal is the real puzzler. What has happened with last year's Team MVP? In 06-07, McNeal accounted for 161 net points, but he's currently only around 60, and almost all of those contributions were in non-conference. In addition, it's the inconsistency from McNeal that is jarring, with a graph that bounces up and down. For Marquette to have the success everyone wants, we need the McNeal that was around last year or for him to take less shots. I guess, if we're looking for hope, one can see a general trend for McNeal of better contributions starting around the DePaul game. The Big Four account for the majority of our team's possessions as well as our success. Hayward has been a stud all season and has really proven to be invaluable. After a slow non-conference start, Matthews has had a net-positive overall contribution. While James had a slump, which we attribute mostly to his injury, he appears to have started to rebound. However, last year's team MVP needs to get back on track or defer to others more if Marquette desires to do well for the rest of the season. Thanks for looking into the conference stats, Henry. It's a better representation of the team as it is now, measured against solid competition, as opposed to the non-conference schedule. It's frustrating watching McNeal struggle. Even defensively -- his bread and butter -- he seems to have regressed from his award-winning performance last season. But with UConn's Thabeet having the type of season he's having, it's unlikely McNeal would be up for it even if he replicated last year's effort. Oh, and eerie how similar the trends were for James and McNeal through the first 10 conference games. Great post. What do you think about who we want to be our top performers? Generally teams only have one or two guys that the others look to at end of the game or lean on during a cold spell. Who are the 'ideal' top players? My opinion is James and McNeal. I would think they could go deeper come March with those two in top form rather than say Lazar and Matthews. Really Lazar has been great and McNeal has been an abomination? Thanks for the analysis now the picture is clearer for us all. Could of saved yourself some time by watching 5 mins of any game played this year. What I see is that when James is playing well, he makes Jerel better. Thank you for the analysis. I appreciate it. Does Crean have someone do this for himself? Be funny if the fans have better statistical information on performance than him. McNeal has never been an efficient offensive player...I didn't need a statistical breakdown to know that (although it's interesting). Turnovers, plus horrible shooting percentages told me that. The one thing about James is he doesn't turn the ball over. Question: Who is keeping these statistics? I've always been suspicious of the TO numbers listed by McNeal. If anything, I think they should be higher! I think it's interesting that a few folks noticed the parallels between James and McNeal. This is something that I completely missed, but we'll keep an eye out for it over the rest of the season. Maybe we'll get a two for one deal with James becoming healthy again. The stats we use are the official scorer stats that come from Marquette box scores. We pull them off of the Scoop Wiki or gomarquette.com. The official scorer for a lot of the games is, believe it or not, John Dodds. There's actually a fair amount of latitude for official scorers (ie - what's an assist?). McNeal's ORtg for the entire season still stands at 100.2, which is much better than his conference ORtg. It's also better than the last two years. Finally, the MU staff keeps a truckload of stats that aren't available in official box scores. I know that they track at least deflections and screens, and I guess they have a fairly comprehensive DB of film too. I'm sure their analysis is sophisticated. As to whether or not they have anyone looking at Dean Oliver / Pomeroy stats for the team... who knows? Just wanted to say to keep the stats coming. Some people are being rude about their value, but it gives some objective foundation for some of the arguments going on. Liked the red disclaimer at the top.